Yummy, yummy applesauce. I am not an applesauce girl, but Mom’s receipe makes my mouth water. So, so good. Okay, I finished the applesauce. I think I learn something new everytime I can. This time it was put screw tops on when cooking! Can you believe I completely forgot to put the screws on?? I was wondering why the lids weren’t popping. Well, I did manage to get a few bottles and we already went through two bottles. 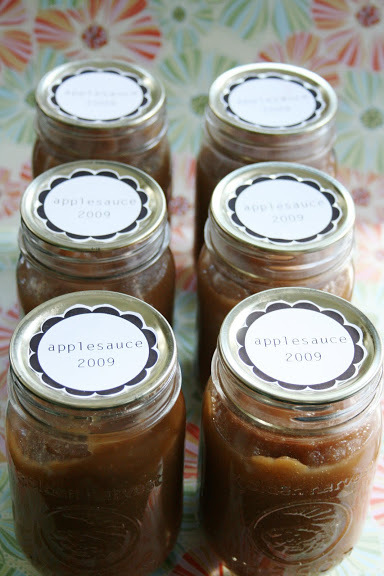 Here’s my Mom’s yummy applesauce recipe. Cook and mash until apples are soft. If you like chunky applesauce ladle into prepared jars and process for 30 minutes. We like our applesauce smooth, so I whip them in my blender and then ladle into jars and process for 20 minutes. Enjoy! This looks great, and I'm totally making it this weekend! Question, though: what does "process" mean? Boil? mmmmmm looking forward to getting some of this to have with perogies. Yes–process means to boil if you are planning to can the applesauce. Make sure your water is already to a boiling point and your jars are sterile and hot before you transfer the applesauce. Once the applesauce is in put lids and screw tops on and place in the boiling water. Keep in for about 30 minutes. Yum, thanks for the recipe. I have about 100 apples we picked that I need to do something with. Yumm, my mouth is water just reading that. I haven't ever tried apple sauce. I'll have to try that.